Consider this your end-of-summer checkpoint. Have you done all those sunshine-related things you were dreaming about back during the polar vortex? Or have you spent a few too many nights on the couch hitting "next episode" on Netflix? Now that July is over, there's only so many days left in the sunny season to eat ice cream, wear shorts and partake in all those outdoor adventures that sums up summer. Read on for 15 ideas that'll make your D.C. summer shine. August is your last chance to get a killer tan, but sitting in the sun can be a drag. The solution? Grab a tube and hit the rapids in Harper's Ferry. The sun will tan you as you float down the river with friends, and small sections of rapids will keep you cool (and on your toes!) River Riders offers several packages for tubing, and LivingSocial has some great deals, too. Pack a junk food-filled picnic, grab a blanket and watch a film underneath the D.C. night sky. From "Frozen" sing-a-longs to old favorites, there's plenty of titles for every movie enthusiast. One outdoor viewing experience you won't want to miss is Screen on the Green, which shows movies against the illustrious backdrop of the National Mall. The festival begins with a screening of 1984's "The Karate Kid" (July 21) followed by "Lover Come Back" (July 28), "Key Largo" (Aug. 4) and "A Soldier's Day" (Aug. 11). For more options all around the DMV area, check out our full outdoor summer movie schedule. D.C. Restaurant Week is a great chance try amazing food at deep discounts! More than 200 restaurants are participating this summer, offering three-course lunches for just $20.14 and three-course dinners for $35.14. Restaurant Week runs Aug. 11-17. Get more information and book tables online. Have you seen the Capital Wheel from afar, but not taken a ride just yet? This summer is the perfect time. At 180 feet, the Capital Wheel gives riders a bird's eye view of the Washington Monument, U.S. Capitol and the Potomac River. It's the tallest observation wheel east of the Mississippi River. You also get to ride in an air-conditioned gondola -- which is pretty cool. The wheel is open daily year-round and consists of 42 gondolas that seat up to eight people. A ride in the Capital Wheel costs $15 for adults and $11.25 for kids ages 3-11. If you want a trip in the VIP gondola (extra bucket list points), which features leather seats, a glass floor and a DVD player, seats are $50 per person. You really can't let summer fade without getting your fix of fried dough, face paint and carousel rides. We're smack in the middle of county fair season, with the Montgomery County Agricultural Fair beginning Friday and running through Aug. 16. Other upcoming fairs: Prince William Fair (Aug. 8-16), Prince George's (Sept. 4-7), and more. See our list to find a county fair near you. Get educated while you drink great beer! D.C. Beer Week aims to educate all on good beer -- "from conception to consumption" -- through various events and seminars Aug. 17-24. The event has different activities every day, and takes place at various locations. Check out a full schedule of events online. Mmm, a day at the ballpark. With hot dogs, nachos, beer -- and even some baseball -- catching a Nationals game is an ideal way to spend a sunny afternoon. Grab your ball cap, check the summer schedule and cheer on the D.C. home team. Just go outside. Just do it. Put your phone on silent and visit one of the area's nearby trails or national parks. There's dozens of spots to experience nature at its finest -- and these summer months are the perfect time to throw on your tennis shoes and get active. Try parking at Fletcher's Cove, Carderock Recreational Area or the Georgetown Waterfront where you can rent a bike or boat by the hour. Whether you're running down the C&O towpath or kayaking on the Potomac, an outdoor adventure is a stress-reducing summer activity that's sure to make you smile. Trade in the bustling city vibe with all its traffic, noise and crowds for aday of small town charm. Stroll down main streets, uncover hidden gems and and take in the summery smells, sights and smiles of a town that's not so big. You won't have to travel far to uncover a peaceful hidden gem near D.C.
Frederick, Maryland was named one of the top 25 "Small Art Cities in the USA." Try a guided walking tour of the historic sites. Cambridge, Maryland is known as "The Heart of the Chesapeake Bay." As the birthplace of Harriet Tubman, this town has a slew of historical stories to tell. Washington, Virginia was first surveyed by a young George Washington. Along the rolling countryside, check out some fine dining, a bed and breakfast and a gallery of fine art. Leesburg, Virginia is just about 20 minutes past Dulles International Airport. You'll get the feel for historic architecture and a chance to shop at the Leesburg Premium Outlets. 10. Visit the scary side of D.C.
Evenings are some of the only times you can catch a break from the city's August humidity, so don't spend them inside! Try taking a "haunted" tour of the city instead! Hunt for ghosts and ghouls while you learn more about the city's scariest legends. LivingSocial has great deals on spooky tours of the city sure to leave you breathless. Visit the National Zoo for your chance to hang out with all the animals, including a quite famous panda cub. Bao Bao is currently on exhibit and she makes for a perfect furry addition to your summer bucket list. Other than a panda sighting, the zoo has a full daily lineup -- including feeding the fish, elephant training demos, and seeing the newest and littlest lion cubs. Escape from some of D.C.'s tourist traps at the Hillwood Estate -- the home once owned by Post Cereal heiress Marjorie Merriweather Post. Pack a picnic and lounge in the gardens, or explore the home's collection of Russian and European art and antiques. The mansion is open Thursday through Saturday, and suggests a donation of $15. What summer is complete without the long lines and high-pitched screams that accompany an amusement park? Head out to King's Dominion for a day and let your inner-child soar. Whether you're brand new to D.C. or a long-time resident, a nighttime stroll around the National Mall memorials is a must-do pretty much every summer. Stand on the steps of the lit-up Jefferson Memorial and pose next to the 19-foot-tall Abraham Lincoln, all while watching the sun go down. 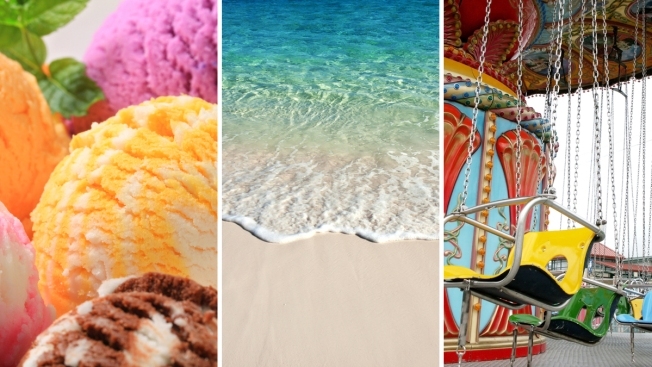 The beach doesn't just exist on your computer's screensaver. If you want a bustling beach scene, head to Ocean City for rides, arcades, minigolf, a host of stores, and that iconic three-mile boardwalk. Or opt for a drive to Virginia Beach and enjoy restaurants, a round of golf, and the nearby state parks all while breathing in the ocean breeze. If you don't want to brave the traffic on the Bay Bridge, opt for the much quieter (and closer) Sandy Point State Park on the Chesapeake Bay for a quick day trip.